In recent weeks I have been working on configuring a workload as a virtual machine and I ran into a scenario where it required a specific vSwitch advanced setting to be used. I will describe the basic setup then the resolution to the issue. 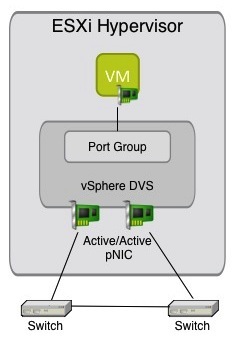 Below is a basic diagram of the setup for any vSphere virtual switch we have all seen before along with a simple workload in a port group. Ultimately the workload inside the virtual machine cannot resolve the traffic going out and coming back into itself. In my testing I have found the third option to be the easiest and it was not a setting I have used before. Essentially this prevents the vSwitch from checking the reverse path when in Promiscuous Mode, and works perfectly. Once it is set you will see the workload functions normally inside the virtual machine. The setting was actually provided by some folks on the VMware Engineering side as something to try to it worked. I actually had a lab setup recently where the first option was easier to use for that setup, so any of the three are viable solutions. You cannot just set one pNIC to “inactive” or standby either, that will not work and that was the first thing I tried. I am actually in the process of doing some messing around with this workload with Mark Achtemichuk as well. I just thought this was interesting and not something you would run into every day on a most virtual machine workloads. I had never found the need for this setting before, but I guess you run into new things every day. Excellent post about something I might never not run into. I am not a network guy so I am a bit puzzled about the setup and would need to help. Why are your vSwitch connected to each other ? Is is even possible ? Secondly why cannot just setting one pNIC to “inactive” or standby either, will not work ? I will try to replicate the setup and see if it works for me. However, using the advanced setting seems more inline with the best practice to me. Just to add (a bit late) to the discussion – the issue “does” persist regardless of whether additional pNICs are in standby or not – so VMs essentially see back-scatter even though a single pNIC is active. Obviously something related to the way the vSwitch works internally that is completely backwards from how we initially believe it should work. Also, a quick tidbit that if you change this advanced setting, existing port groups already set to allow promiscuous mode will not be changed “live”. You need to change the port group’s promiscuous mode setting back to Reject, then again back to Accept (essentially causing a refresh of the setting at the port group level) before it becomes active. This will prevent you from having to reboot the host. I am not a network guy so I am a bit puzzled about the setup and would need your help here.